VR Zone got its hands on a picture of MSI's GeForce GTX 660. This fifth GK104 based part is expected to be introduced at next week's Computex. The higher-end part, the GK104 is already being used for GeForce GTX 670 and GTX 680 as well as dual-GPU options GeForce GTX 690 and the Tesla K10. But, NVIDIA is not yet done with the GK104 chip. 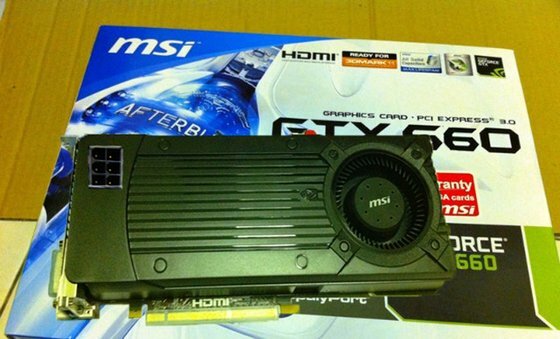 According to a leaked image, MSI is one of partners to launch the GeForce GTX 660, which is poised to be the most affordable GK104-based product yet. While the image of the board is obviously photoshopped (the lower part of the bracket is not present, the heatsink has a six-pin connector slapped on top), we checked with our sources and the product appears to be legit. The highlighted single six-pin connector on the heatsink was positioned there to highlight that the board cannot pull more than 150 Watts, which the author of the leaked image made sure off.